After just over two months of teasing, Fernando Alonso and Jimmie Johnson have finally announced that they will be driving each other’s cars at the Bahrain International Circuit on the 26th November, the day after the Abu Dhabi GP. No more information than that is given in the admittedly cringe-worthy fifty-second clip posted on both driver’s social media accounts, but it does at least draw some sort of an end to the speculation that had been conjuring up ever since this was first hinted at in mid-September. The first video, posted on 12th September, set up the idea of a car-swap scenario with both drivers expressing interest at the events on the opposite side of the Atlantic. Really, this goes back much further than September, in fact back to late January when the pair took part in a rather amusing photo-shoot at the Daytona 24 hours, which can be essentially described as a staring competition (with a cameo from Lando Norris). The next teaser came nearly two weeks ago with another equally cheesy clip, showing Alonso and Johnson going about their training regimes while watching each other’s races, though both of them were winning their races so it must have been from quite some time ago! This whole saga has been very typical of Alonso’s appearances on social media of late, generally communicating through the medium of cryptic GIFs and tweets. Basically, it’s made everyone do what we’re doing now, talk about both Alonso and Johnson, whose careers have taken respective nose-dives in recent years. Johnson hasn’t won a race all season in the NASCAR Cup Series, his last win was back at Dover in 2017 and many have been speculating about his future in the series. 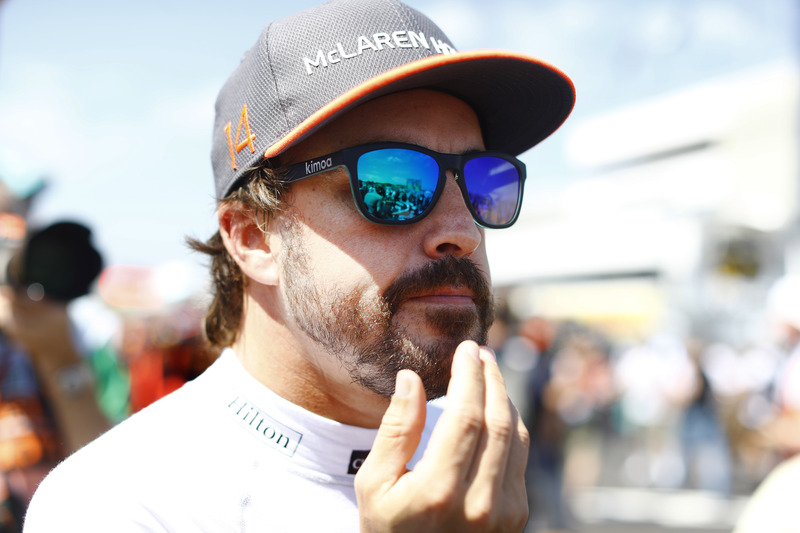 It’s a very similar story for Alonso whose winless drought stretches back to the 2013 Spanish GP, with his F1 career coming to a conclusion at the end of this season. The car-swap could be seen as a publicity stunt for both drivers, both wanting to remind the world of their greatness despite their respective lulls. Equally, they could just be doing it for a bit of fun; they’re both of a similar ‘drive anything’ type of personality and have clearly formed a strong friendship over the years… This kind of thing has probably been on the cards longer than anyone else knew, they just had to work out how to make it feasible. Alonso himself may view this as the start of his 2019 ventures which remain as of yet unannounced. He’s hinted that he’ll probably not be doing a complete season of anything but instead dipping in and out of various series with the Indy 500 obviously a target and rumours that he may be attempting the Daytona 500 as well. Whatever the reason behind it, the car-swap will be very interesting to see with more focus probably on Alonso’s NASCAR performance than Johnson’s F1 run for a multitude of reasons, mainly that the Spaniard will almost certainly drive a NASCAR again whereas Johnson is unlikely to get another go in an F1 car. Previous PostPrevious FIA rejects Haas disqualification appeal. Next PostNext Renault: Building everything from scratch.